Duct tape holding down the mailbox? Did the plow take it out? It's time for a new one. 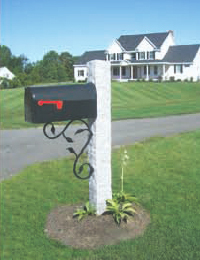 We have rock solid mailbox posts with a variety of options. Whether your budget is $250 or $1,000 we have the post your looking for. 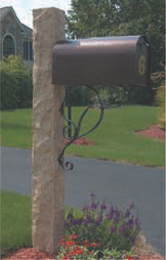 Curb appeal starts at the curb with a gorgeous new granite mailbox post. With 6 finish options, 8 bracket options you can customize a post to fit your landscape. Planters, signs, and flower boxes are also available. For a real polished look have your house number engraved in your post. 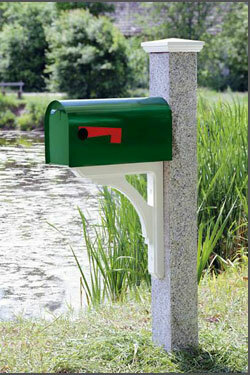 It won't take long to transform your mailbox post, but they are heavy. If you would like someone to do the heavy lifting, let us know. We can hook you up with a strapping contractor.